There are two basic forms of drain cleaning that we use: cabling and hydrojetting. Using a cable, or snake as some people call it, will open a line and get your waste water moving again, but hydrojetting will clean your line by scouring out the debris and rust buildup with high pressure water, which is the most efficient way to clean your line. The first step we take when we look at a line is to run a flow test. Sometimes a line will be running slowly, but not completely clogged. Debris like hair, soap, makeup, grease, lint or food, over time can build up in a line and cause a restriction. We can cable the line and get it open whereas things are flowing again, but it’s possible that it could clog back up again without scouring the line completely clean. Hydrojetting returns it pretty close to the original state in which it was installed. Hydrojetting gets the pipe as open as possible by using high pressure water – but not high enough pressure to cause harm to your pipes. It has enough pressure to take out that old rust, and grease build-up that’s been collecting in your pipes for the last 20 years. We usually recommend hydrojetting for lasting, long-term results. What happens if it burst my pipe? Hydrojetting is not high pressure enough to burst a pipe of good integrity. In our 15 years of using a hydrojetter, we’ve never burst a pipe unless it was almost corroded through. We work with some of the best plumbing companies in Portland if such issues arise. Hydrojetting pressure is anywhere between 2200 and 3000 PSI, which is the optimal pressure for removing grease and soap buildup from a line. Basically, we just take a hose that has a jet that sprays water forward to clear the way for the hose and four jets that spray backwards to scour the line as we are pulling it back. Hydrojetting is used for rain drain cleaning as well. It is a great cleaning process for removing all the organic material from your oustside rain drains and get them flowing again. But we can also take that hose into the house to help clear some of the nasty clogs inside your house. 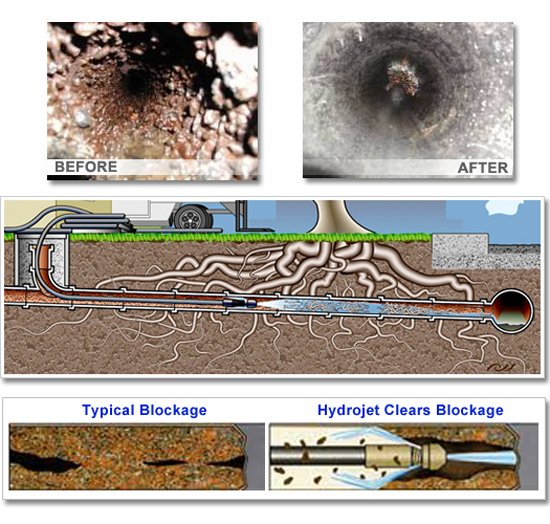 Hydrojetting can solve just about any type of clogged drain. It is a wondereful, time proven cleaning process that has been used in our industry for over 25 years.